Our world is facing the largest displacement of people since the end of World War II. Nearly 20 million men, women, and children have been forced to flee their homes and are now waiting for a chance to rebuild their lives. Less than one percent are resettled in countries such as the United States. Since 1965, Tennessee has been a place of protection, hope, and opportunity for those fleeing persecution. In 2016, our state welcomed 2,051 refugees from all over the world. Resettlement agencies, faith institutions, businesses, and others have worked hard to ensure that these refugees receive the tools and support they need for successful reintegration. At the same time, Tennessee is also a testing ground for the country's most extreme anti-refugee policies, championed by nativist organizations who have long worked to erode support for resettlement programs. While their views and policy proposals were largely outside the political mainstream in the years past, the recent global tragedies, the ongoing global refugee crisis, and election-year rhetoric allowed these once fringe policies to gain broad support. For more information on the history of anti-refugee activity in Tennessee, visit here. TIRRC works to protect the integrity of the refugee resettlement program at the local and state level. Together with our national partners, we promote federal policies that welcome and support successful refugee integration. For more information or to join the campaign, contact Judith at judith@tninnmigrant.org. In 2016, the state legislature took the extreme step of voting to sue the federal government in an effort to end refugee resettlement. Although the attorney general refused to file the suit, noting that the case was likely to lose, the Tennessee General Assembly didn't listen. In March, the state filed their lawsuit, betraying our values, putting resettlement at risk, and potentially setting a dangerous precedent for communities across the country. But we're standing up for refugees. In June 2017, we took legal action and asked the court to allow us to be part of the lawsuit. Our members, both refugees themselves and Tennesseans who want to welcome refugees, would be deeply harmed by an end to the resettlement program. We've asked the court to let us become part of this case so we can mount the strongest possible defense of refugee resettlement. In March 2018, the district court dismissed the lawsuit, but the state filed an appeal. Read more about it here. We are proud to be represented by the fearless legal team at the ACLU and the ACLU of Tennessee and to be joined in this case by our member organizations Bridge Refugee Services, Inc. of Knoxville and Chattanooga and the Nashville International Center for Empowerment. We are so excited to represent our many members across the state in defense of the life-saving work of refugee resettlement, to stand up for our values as Tennesseans, and to ensure that Tennessee continues to be a place where families fleeing violence and persecution can find safety and opportunity. In the courts, in the legislature, and in the streets, we'll continue to say loud and clear, refugees are welcome here! As communities across the country organize in response to cascading anti-refugee rhetoric and policies, the Tennessee Immigrant and Refugee Rights Coalition (TIRRC) has issued a report, Countering the Backlash: Strategies for Responding to Anti-Refugee and Xenophobic Activity from the New South, with support from the J.M. Kaplan Fund. Long before the attacks in Paris, national anti-refugee organizations had been working to erode support for refugee resettlement. While their views and policy proposals have historically been far outside of the national mainstream, they found fertile ground in Tennessee, and are now finding favor more broadly. Countering the Backlash sheds light on the long history of anti-refugee organizing, clearly demonstrating that current policy proposals to limit or end refugee resettlement are not innovative responses to new threats or a tailored response to a post-Paris world but rather the latest in a long campaign to slow changing demographics and limit Muslim migration. Over the past several years, activist groups supporting the anti-refugee backlash identified the combustible conditions in Tennessee, fueled by anxiety in response to rapid demographic shifts, as an opportunity to advance their agenda. Countering the Backlash makes clear that the current backlash against the refugee resettlement program has been brewing for years, fueled by state-based anti-immigrant legislation, like Arizona's Senate Bill 1070 and its copycats across the country, growing Islamophobia, and a more generalized scapegoating of the foreign-born in times of economic insecurity. Similarly, these groups are now exploiting the fear and uncertainty communities face in the wake of terrorism to advance the same agenda across the country. Despite having a small, albeit quickly growing, foreign-born population and little progressive infrastructure, immigrant communities and advocates in Tennessee succeeded in preventing most regressive legislation from becoming law and found ways to turn the tide. What happened in Tennessee is a story of hope and resiliency, demonstrating that, even in the most hostile environment communities can respond to legislative and rhetorical threats as an opportunity to organize, build power, and develop the capacity to shift the political climate. 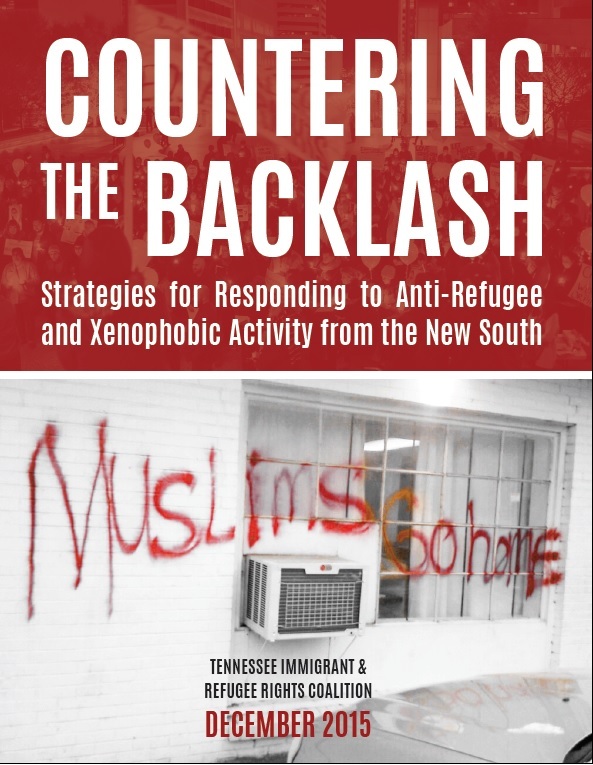 Countering the Backlash offers lessons learned and recommendations for organizations across the country that are working to defend refugee resettlement, combat Islamophobia, and build more welcoming communities.